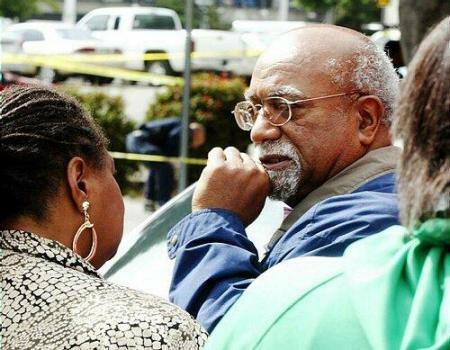 Whenever August 2 rolls around, I think of how, why, when, where and who shot our inspirational, indefatigable Post Editor Chauncey Bailey dead in downtown Oakland. While writing these thoughts I am wearing the same jacket that I wore on 2007 because it reminds me that I too was threatened and targeted by those who killed Chauncey. Amaranth Modacure, a former confident, photographer, assistant writer and researcher of Chauncey’s, always drops by to share remembrances. She shared the notes and photos of “Reverend Rap,” the play that Chauncey was writing. We laughed at how Chauncey allowed a homeless person to sleep in his walk-in closet because another struggling journalist was sleeping in his living room. Many people didn’t stay long because Chauncey didn’t drink or smoke, nor did he permit it, in his home. Amaranth wishes Chauncey were still alive so he could witness, write and film her daughter’s upcoming wedding at Mills College in September. Speaking of weddings, Chauncey’s fate might have been altered if he had chosen to spend the night at the home John Le Tung with whom he was making plans to journey to Vietnam to get married again. Chauncey left John Le’s home around midnight, ironically around the same time the police were checking out the locations of those involved in his murder. We had scheduled a meeting at 7:30am to discuss the follow-up on the warning he had received from some police officers to stop his series of stories about their activities and city hall transparency. He was walking westward from his home near Lake Merritt and I was walking eastward from my home in West Oakland. I heard the sirens and saw the police commotion 3 blocks away as I entered our building. The call from the police was chilling as I looked out from our 12th floor office with a direct view of Chauncey laying there, gunned down, beneath the tree that has since been cut down. Thanks to Mayor Ron Dellums and local reporters, we were able to stop the misleading statements about me, statements made by OPD for the 60 Minutes television program, which would have made me a target.